Time: Saturday 9:00 a.m. – Sunday 12:00 p.m. This program is a truncated version of the June Planning for Pups to accommodate local residents who want to participate in the program or participants that have time constraints. There is only one overnight session on Saturday night at the Center Auditorium. Learn about the plans for new pups for the Exhibit Pack and discover the skills and dedication necessary to be a pup care program participant in 2020. 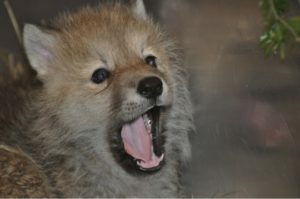 Tentative program activities include a trip to a local dog yard to gain animal handling experience with sled dog pups, wolf care staff narrating video highlights of the center’s history of wolf management, observations of the Center’s Exhibit Pack to understand behavioral modification and discussion of the detailed plans for obtaining, socializing and integrating pups into the Exhibit Pack. This program is a prerequisite program for individuals interested in applying for the limited number of Pup Care Positions available during the summer of 2020, but does not necessarily guarantee a pup care position in 2020. Download important program details [PDF] (cancellation policy, details on lodging, meals and transport, packing list and sample itinerary and Required Health Form). Read all documents very carefully. Winter wear for this program is extremely important, and must not be overlooked.